Happy New Year Doug Weight! The Islanders’ center— one of the best playmakers in the NHL over the past two decades—notched his 1,000th-career point Friday night against the Phoenix Coyotes. Weight becomes the 73rd player in NHL history to reach the 1,000-point mark, and the eighth American-born player to do so. Weight earned the milestone point when he assisted on Richard Park’s third-period goal against the Coyotes at Jobing.Com Arena. "It was unbelievable for the team to stand up and give me a hand and the crowd, too," Weight said. The veteran reached the mark in front of about 30 friends and family members. "I couldn't really move all game today," Weight said. "I felt a little nervous. It worked out, having my family here. It's something I'll be proud of and remember the rest of my life." It is an individual pinnacle for Weight, who won a Stanley Cup championship with the Carolina Hurricanes, has competed in the Olympics and World Cup for Team USA, and has played in more than 1,000 NHL games. It has been a long, eventful road for the 17-year veteran. Weight was drafted by the Rangers with the 34th overall pick in the 1990 NHL Entry Draft and played his first NHL game during the 1991 playoffs. Doug Weight shows off his 1,000-point puck with teammates Bill Guerin and Richard Park. 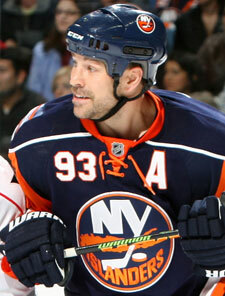 He was traded to the Edmonton Oilers in 1993, and had his best season in 1995-96, compiling 104 points. In nine seasons with the Oilers, Weight recorded 577 points. Following the 2000-01 campaign, Weight was traded by Edmonton to the St. Louis Blues, where he continued to be productive, scoring 225 points in less than four seasons. Just before the trade deadline in 2006, Weight was dealt to the Carolina Hurricanes and helped the team win its first-ever Stanley Cup against his former club—the Oilers. It was also the first Stanley Cup for Weight, who was forced to miss Game 7 of the Finals with a badly separated shoulder. He was so nervous, that he did not watch any of the game, choosing instead to remain in the locker room. However, throughout the course of the game, Weight slowly dressed himself in his full equipment. He then joined his team on the bench for the final seconds. Weight re-signed with St. Louis in the off-season and played in all 82 games during the 2006-07 season. However, Weight split the 2007-08 season with the Blues and the Anaheim Ducks—and struggled for both clubs, compiling a total of 25 points. 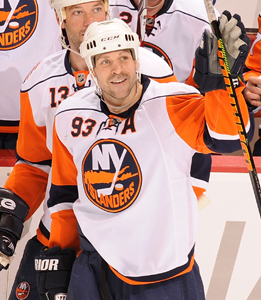 Despite his lack of productivity last season, the Islanders took a chance that the numbers were an aberration, and signed the free agent before the 2008-09 season. The move has paid big dividends. Weight has been reborn with the Islanders. Reunited with his good friend—Islanders Captain Bill Guerin—Weight has averaged nearly a point per game this season. His 32 points in 36 games is his highest points-per-game ratio since he recorded 67 points in 70 games in 2002-03. Click here to read more about Doug Weight, by NHL.com's Dan Rosen. 1st career goal—Scored in his first regular season NHL game on October 3, 1991, as a member of the Rangers at Boston against Boston Bruins goaltender Andy Moog. Worth the Weight: Every stat you ever wanted to know about Weight!